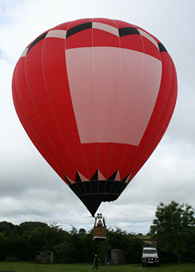 Due to an increase in demand for private and exclusive flights, Aerosaurus has decided to upgrade its smallest balloon. The balloon will be used to provide champagne hot air balloon flights in the Devon and Cornwall area at our standard flight meeting locations as well as Dorset, Somerset and Wiltshire. Before it was scheduled for exclusive flights we wanted to thoroughly test it however and make modifications. Now with a new camera line attached to take In-Flight Photos with, it is ready. The balloon was tested and inflated by Charlie Street, who runs the pilot training school Aerosaurus operates. On a separate note sponsorship of the balloon is available with space on the large 120,000 cubic foot for advertising. For more information and details regarding advertising please visit the aerial advertising page in the our corporate area.